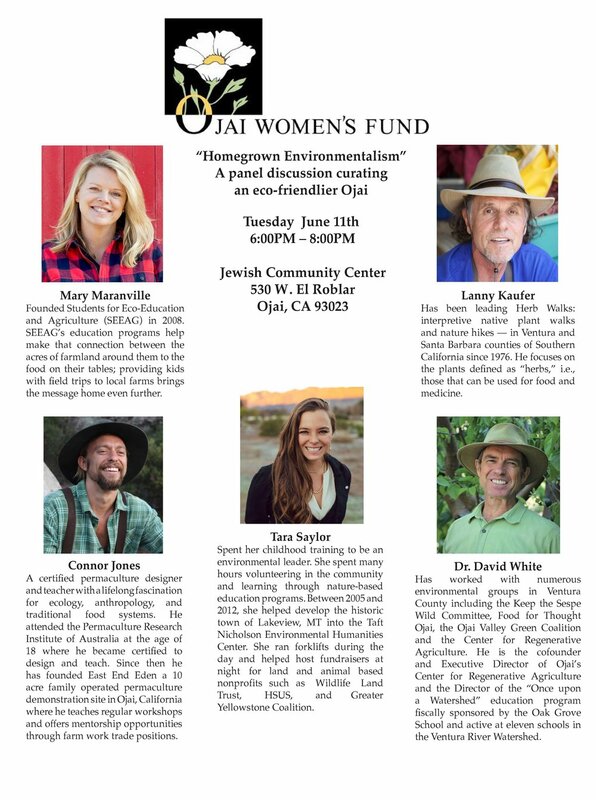 The Ojai Women's Fund 2019 Technical Assistance Grant Workshop will be held on Thursday, March 7, 5:30 to 7pm at HELP of Ojai, 111 Santa Ana Street in Ojai. Attendees will be walked through the 2019 application, application process, and will have the opportunity to ask questions. The grant application will be distributed and will also be available online May 6. Light refreshments will be provided and there is no fee to attend. For more information, email owfgrants@gmail.com. Who's on our 2018 Ballot? On September 26, the OWF Grants Committee will present descriptions of the 2017 nominees who have been chosen to be on OWF's 2017 Ballot. Given that space is limited, voting group leaders will have first priority for seating. But if room is available, any interested OWF member is welcome to attend. The presentation will be made at the Ojai Art Center. The purpose is to better equip group leaders to discuss the nominees with their groups before voting on the ballot. The ballots will go out on or about October 2 with the anticipated voting period to fall between October 2 and October 23. Group leaders will be meeting with their groups during that period to discuss the ballot and vote. Ojai Strong: A Women's Life in Song is a "Friend-raiser"(not fundraiser) to honor the Ojai Women's Fund. It will be performed at Matilija Auditorium for one night only, Friday, September 15 at 8:00pm. Tickets are available at www.ojaitheater.org or 649-1937. It is presented by the Ojai Performing Arts Theater. Learn more about the Ojai Women's Fund (OWF) and meet other amazing women looking to form an OWF giving group! Light refreshments and wine will be served. Learn more about the Ojai Women's Fund (OWF) and meet other amazing women looking to form an OWF giving group! Ojai Women's Fund - 2017 Kick-Off Event! Join us as we honor our inaugural class of nonprofit grant recipients! Six organizations serving the Ojai Valley will share in over $50,000 in OWF Funding. In mid October, OWF members and groups will begin voting on our 2016 grant recipients. All donations and membership dues must be received by September 1, 2016, to be applied to 2016 grant opportunities. To become a member, please contact us or donate now. If you’re a member without a group; are considering membership; or reaching out to friends and acquaintances to join OWF, please spread the word and plan to attend one or both gatherings to meet other women looking to join individually; to join a group; to join as a group; or to create a new group. The Ojai Women’s Fund has identified five funding priorities. A panel of community experts will present an overview of current needs, future trends and strategic funding opportunities in each area. Please mark your calendars and be sure to attend. Your feedback, opinions and recommendations will help shape the Ojai Women’s Fund agenda as we move forward. Modeled on traditional giving circles, the Ojai Women’s Fund pools contributions from Ojai women to provide meaningful financial support to local non-profit programs that address critical needs in the Ojai Valley community. 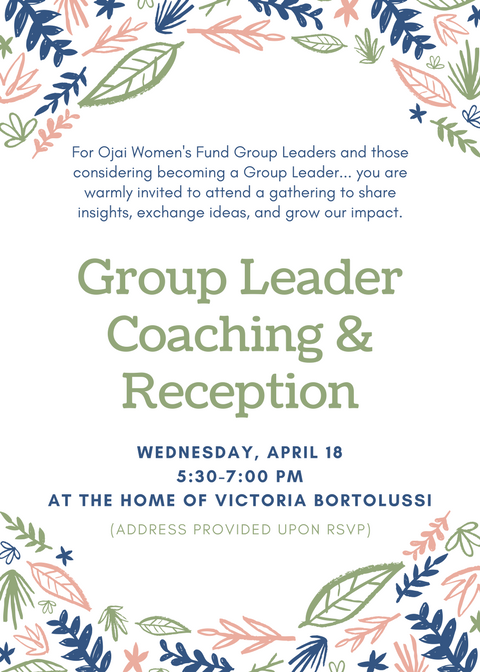 You Are Invited - 5 p.m.
We are looking for women who care, who want to become leaders in philanthropy, and who will make a difference in the Ojai Valley Community. founder of Zhena’s Gypsey tea. Help us spread the word … bring a friend or bring a group of friends! Help us plan – let us know if you can attend. Please call (805) 746-3096 to RSVP. This event was made possible by the volunteer efforts of the Ojai Women’s Fund Inaugural Steering Committee: Peggy Russell and Karen Evenden, co-chairs. Kyle Crowner, secretary. Thinkers and Doers: Carolyn Bennett, Barbara Hirsch, Susan Leech,Carolyn Olsen, Aryna Swope, Maureen Volland, Jane Weirick, Sandi White.